I realize this series is never coming back to the place where it holds so many fond memories for players and fans alike. Penn State-Pitt was the No. 1 game and season-ender on each other’s schedules, and we all know the history of how the schools went their separate ways. Pitt remains interested in playing the game annually, and of course it does: Penn State’s presence helps assure the Panthers can sell out nearly the rest of their home schedule. Penn State, on the other hand, practically can’t be bothered and would prefer to play somebody else, anybody else, in the non-conference. Actually, the Nittany Lions can’t be faulted for Idaho and Nevada, Delaware and Villanova. Those are non-return games that all Power-5 teams feast on. The vast majority are rent-a-wins without much resistance, unless one of them is named Appalachian State. With the current four-game set with Pitt expiring after next season — the 100th game in the series but only the eighth in the last 27 years (1997-2000, then 2016-19) — Penn State has set up home-and-homes with Auburn, Virginia Tech and West Virginia. Supposedly there’s a series with Texas in the works. None of those series can be criticized and, in fact, Penn State will probably be an underdog when it visits each. I get that the Nittany Lions can’t play Pitt very often. Just look at 2021. 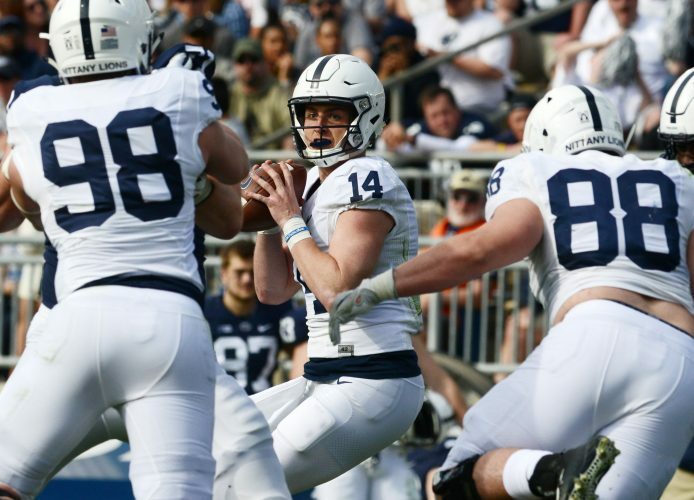 Penn State opens at Wisconsin, hosts Auburn in week three and then heads to Iowa. You’re hardly going to plug Pitt into week two. In 2024, Wisconsin and Nebraska are both on the schedule, in addition to Ohio State, Michigan and Michigan State. So to make a case for regularly adding an old, emotional rival is not realistic. But when the Nittany Lions last week announced a two-game, home-and-home with Temple, that did raise some eyebrows — at least mine. Very few are clamoring for a series with Temple, and many more Penn State fans would like to see at least an occasional renewal with Pitt. The two dates added with the Owls – 2026 and ’27 – could have been for Pitt. Despite the 2015 opener at Lincoln Financial Field, when Temple won for the first time since 1941, the Owls do not pose the same threat as Pitt. While James Franklin wants to liken Pitt to every game on the schedule, there’s no mistaking that it’s a big game to Pitt. Pat Narduzzi admits that, and the Panthers have played like it, at least in 2016 when they jumped on Penn State for a 28-7 lead at Heinz Field before the Lions realized what hit them. And what could hit them again Saturday night. Too many of college football’s old rivalries have been lost. Scheduling Pitt for the two dates the Lions selected Temple would have been the right thing to do. And it’s never a bad time to do the right thing.